Rings are often advertised as antique vintage engagement rings or as containing an “authentic antique diamond,” but it’s difficult to know what’s actually true. Finding out if a diamond ring is truly antique or authentic is not a process exclusive to jewelers and technicians. Below is a guide for determining whether a diamond is modern or authentically antique. There are five principal methods for antique diamond authentication. These techniques (aside for the last one) can be done at home with little or no professional tools. The easiest way to know if a diamond is antique is by examining the actual shape of the diamond. There are 100’s of diamond shapes on the market right now. Almost all of them have been developed within the past 40 years. There are about 10 cuts that are genuinely antique. If the diamond you are examining has a shape that was recently developed, it obviously can’t be antique. This technique is the first line-of-defense when analyzing a loose diamond or even a diamond within a mounting. 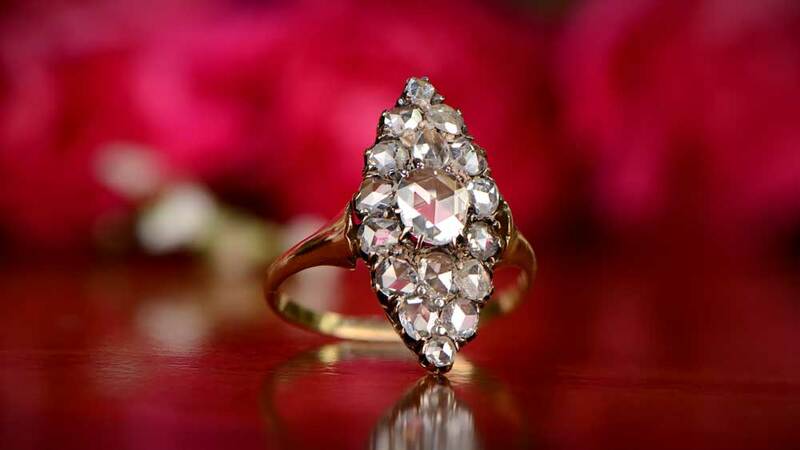 We recommend to first study our vintage diamond page to determine if the diamond belongs to one of the antique shapes. These diamond shapes listed above have the possibility of being old. Of course, the diamonds could be recent versions of the diamond shape. In order to be certain that the diamond (which conforms to the list) is antique you will have to move onto to technique 2. If your diamond has any of the shapes in the second list, you can know with certainty that it is not antique. None of the criteria below will help prove that your diamond is antique. In order for a diamond to be antique it will obviously have to a shape that was invented over 100 years ago. When looking at an antique, authentic diamond, the culet is usually one of the tops indicators of age. The culet is the facet at the very bottom of the diamond. It’s the tiny facet that runs parallel to the table and is typically easily visible, even to the untrained eye. Modern diamond cutting techniques enable the jewelers to shave down the bottom-culet so that it is far too small to see. Even when examining a modern diamond with a loupe it will be very difficult to find the culet. The technology to finely cut the tail-end of a diamond did not exist 100 years ago. When looking into any authentic antique diamond from above, the culet should appear in the center. The culet may be a circle, oval, octagon, or rectangular shape. An authentic diamond can also be authenticated by examining its setting or mounting. There are so many indications on jewelry that will help reveal its age. Use the jewelry to give you insight on the age of the diamond. Use a diamond loupe to magnify the piece and analyze the jewelry carefully. Unfortunately, this method is not foolproof. 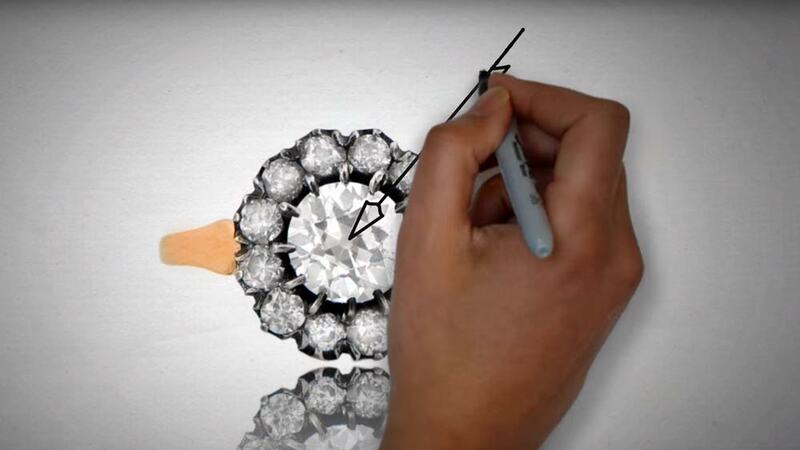 Placing a modern diamond inside of an antique jewelry piece is a very easy job. The vintage market has many examples of antique jewelry with modern stones. The girdle is the thin section that winds around the side of a diamond and separates the crown from the pavilion. Most diamonds from after the 1940’s will have a polished girdle. If the girdle is not transparent but rather appears to have a sheen of frost over it, it will almost certainly be an authentic antique diamond. This authentication method, however, will only prove if a diamond is antique but won’t prove that a diamond is modern. There are many genuine antique diamonds in the market that do have a polished girdle. It has become a disturbing trend among jewelers to polish their antique diamonds. If you want to read our complete guide on understanding the diamond girdle, click here. Finally, if all else fails, there is one other option. If identifying an authentic diamond is important to you, find a company that specializes in the certification of antique jewelry. Jewelry professionals can identify the time period of a diamond by examining the shape and facets of the stone. 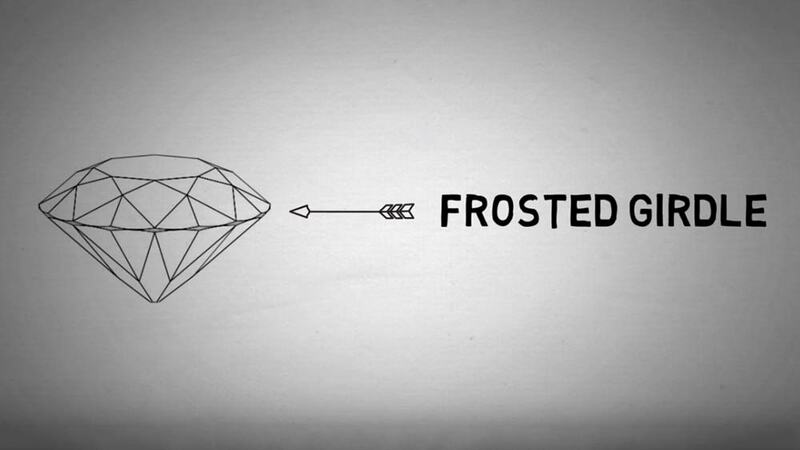 Diamond cuts have evolved from early old mine diamond cuts to today’s brilliant cut diamonds. Trained professionals will be able to analyze the diamond to determine the approximate afe of the diamond.